An old, inactive channel on the floodplain. May be partially or entirely filled. Extends over more than one meander wavelength (thereby differentiating it from a meander cutoff). Can have a wide range of planforms, from elongate and relatively straight to irregular or sinuous, reflecting the morphology of a former primary channel. 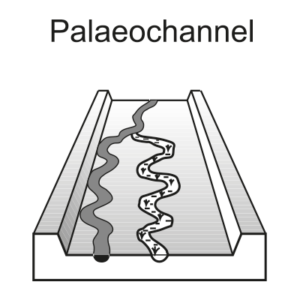 Low-sinuosity palaeochannels may be overprinted with flood channels. May have an upward-fining fill comprising a channel lag of coarser material with finer, suspended-load materials atop. Caused by a sudden shift in main channel position (avulsion), generally to a zone of lower elevation, abandoning a channel on the floodplain. The palaeochannel may subsequently fill with suspended-load sediments derived from overbank flooding. They record palaeoplanform and geometry of the avulsed channel. If this is markedly different from the contemporary channel, it may indicate a shift in sediment-load, discharge or distribution of flood power within the system.